Michigan's Novi High School's new $3 million fitness center replaces an outdated weight room that served only a few of the 2,000 students. Now a modern facility, it welcomes everyone, including 30 varsity sports teams and 10 physical education classes per semester. 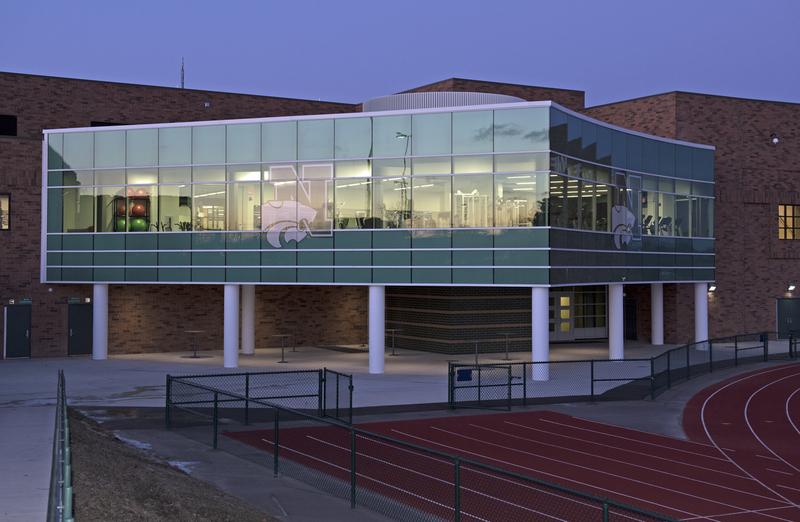 Featuring a glass and metal curtainwall by Tubelite Inc., the new fitness center offers natural light and views overlooking the north end zone at the school's Wildcats Stadium. Opened at the start of the 2016-17 academic year, the 5,700-square-foot space more than doubles its predecessor. Novi High's new fitness center contains both a traditional weight room and a large area outfitted with six treadmills, six elliptical machines, five stationary bikes and other cardiovascular equipment. "No matter if you've ever lifted a weight or done cardiovascular training, whether you are on a sports team or not, there's something there for everybody," said Novi Community School District's assistant superintendent of business and operations, Steve Barr. Barr oversees construction projects in the school district. During the planning stage, he and TMP Architecture's chair John Castellana, FAIA, REFP, held visioning sessions with students, coaches and physical education teachers. With their feedback, the new fitness center's design was refined into a cohesive, functional space plan. "There was a clear need for division between the cardiovascular and weight training areas. In addition, it was requested that a stretching area be located in a quiet corner," explains Castellana. "Aesthetically, the District wanted to make a strong statement about the variety and vitality of the athletics programs at Novi High School." Castellana elaborates, "The design opportunity was to create an innovative fitness center that would be an interior and exterior magnet for the high school. Due to the proximity of the competition running track and football field, the design responded by incorporating a slightly curved glass façade that reinforced the geometry of the site and allows spectacular views to the stadium." He continues, "Also, because the existing high school was predominately brick with very minimal windows, the new glass-enclosed center becomes a visual icon during the day and at night to highlight the 'Home of the Wildcats!'" Working closely with construction manager McCarthy & Smith to bring this vision to reality, glazing contractor Preferred Glass Inc. selected and installed Tubelite's 400 Series curtainwall systems. "The Tubelite system offered the necessary flexibility to craft a unique design. This success of this project incorporated a concave curved wall façade with an acutely angled corner condition," describes Castellana. "We needed to meet very exacting specification standards and Tubelite was the perfect solution to provide us the performance that is critical in a high-profile project," emphasized Castellana. "Tubelite is the indispensable element for a project of this caliber." TMP's senior associate Brett Carte adds, "The curtainwall's installation location combined with the construction tolerance variances made it impossible to fabricate curtainwall framing members until the structure was in place and field measurements could be taken." 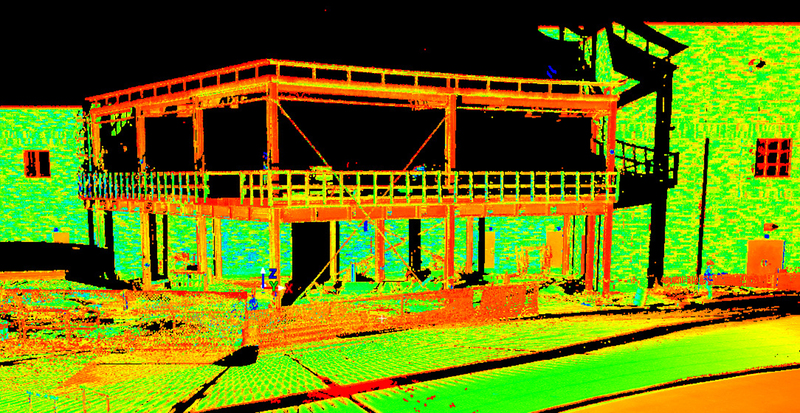 According to Howard Beindit, president of Preferred Glass, "very accurate measurements were produced" by Great Lakes Geomatics using 3-D laser scans of the structural frame. He says, "Great Lakes verified the dimensions and layout of the structure was going to mate up exactly to our fabricated shop drawings. This turned out to be a great tool to alleviate any issue during the installation process and proved the final product would work perfectly." "These measurements allowed the vertical members of the curtainwall to center on the exposed structural steel columns and hold tightly to the curvature of the building's footprint with precisely mitered horizontal members where they meet the vertical members," says Carte. 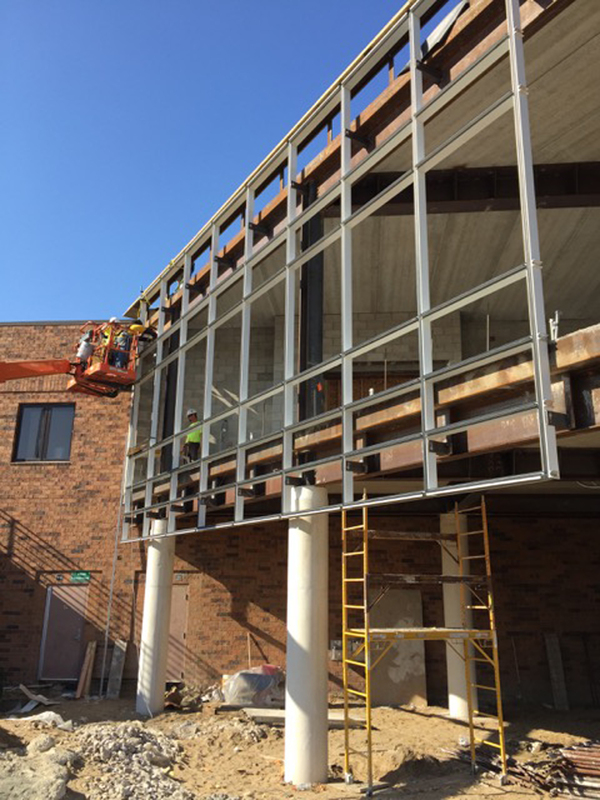 The curtainwall framing system is anchored to the building with cantilevered clips back to the structural steel framing rather than resting on a traditional sill wall. "Construction-wise, the main challenge was access," notes Castellana. "The site is at a depressed level with no vehicular access from the main building level. Construction space was greatly restricted due to the addition's position directly between the existing building and the edge of the existing track/football field. A temporary retaining wall and ramp were constructed to accommodate construction vehicles and equipment." In light of the project's challenges and complexity, McCarthy & Smith's superintendent Dave Sprecher said the curtainwall "went together pretty well. The teamwork was good. And, the school's very happy with the result." Contributing to the project's attractive appearance and durability, all of Tubelite's 7-inch-deep aluminum framing members for the curtainwall were painted by Linetec in a Bone White color. Using a 70 percent polyvinylidene fluoride (PVDF) resin-based coating, the finish meets or exceeds the American Architectural Manufacturers Association's stringent standard, AAMA 2605 high-performance exterior specification for a lasting positive impression. The nearly floor-to-ceiling curtainwall system frames the "spectacular views" sought by students to enjoy while they work out in the facility. Proud of the accomplishment, assistant superintendent Barr noted, "We have some colleges and universities telling us that we have a better fitness room and equipment than what they have. ...There's something there for every student." Established in 1945, Tubelite celebrates 70 years of dependable service, fabrication and distribution of architectural aluminum products. Part of Apogee Enterprises, Inc., the company is an industry leader in eco-efficient storefront, curtainwall and entrance systems, and recognized for its fast, reliable and consistent delivery. Tubelite's corporate office, fabrication, warehouse and shipping operations are located in Walker, Michigan. Its Dallas location provides additional fabrication, warehouse and shipping operations, and its facility in Reed City, Michigan, houses the company's aluminum extrusion operation. Filed under: AAMA, Linetec, Projects, Tubelite Inc.